Fists fly and heroes come to blow in the latest animated feature from the DC Universe Animated Original Movie line. Based on the initial six-issue “Public Enemies” arc from the Superman/Batman comic series, Superman and Batman go toe to toe with a plethora of friends and foes in an attempt to stop yet another evil plot courtesy of Lex Luthor. And, yes, while this movie is just filled to the brim with overblown action sequences and fight scenes, it also doesn’t try to be anything else but a big “smash-em-up” with an assortment of different DC characters from beginning to end. As much as that may be a hinderance for the movie, it’s also the biggest selling point for Superman/Batman: Public Enemies as well. First off, Superman/Batman: Public Enemies is fun. It’s an easy movie to get lost in, and one that definitely doesn’t overstay its welcome. Clocking in at 67 minutes, credits and all, the latest installment from the DC Universe Animated Original Movie line just zips along at a brisk pace. Probably one of the more politically-minded animated features to come out of DC Comics and Warner Home Video, writer Stan Berkowitz improves upon the original comic book source material by giving us a more solid foundation for the inevitable fisticuffs and jettisoning all the stuff that doesn’t essentially matter to the main story. Admittedly, using the current global economic meltdown as a starting point for Superman/Batman: Public Enemies is a bit dark for this seemingly light-hearted movie, but it does work in setting up and justifying some of the character actions later down the road, as out of place as it may seem. The movie is enjoyable, yes, but is it groundbreaking in any way? Not really, no. It’s a pretty standard team-up story from start to finish, to be honest, but a fun one drizzled in summer popcorn nonetheless. It seems quite obvious that this movie was never intended to be anything more than a fun diversion for fanboys, an excuse to see the two biggest heroes from the DC Universe hop from battle to battle, and it works as just that. And while that really works for the movie, it does also work against it, especially following on the heels of Wonder Woman and Green Lantern First Flight, two films that attempted (and succeeded to an extent) on feeling like epic big-screen adventures. Superman/Batman: Public Enemies may seem like a bit of a smaller movie when compared to the previous two installments of the DC Universe Animated Original Movie line, even with the gigantic robot-laced finale, but it still manages to be a rip-roaring fun time. I wouldn’t be surprised if this feature is one that fans will find themselves revisiting many times, given how easy it is to just get into the movie. Also deserving a solid round of applause are the character designers for the feature, who successfully catch the look of Ed McGuinness’ artwork from the original comic but with a slight twist. Hats off to Lesean Thomas, Jeff Johnson, Jose Lopez, and Thomas Perkins for blending their unique styles and coming out with with a look that pays a respectful homage to the source material. Sure, every hero looks laughably muscled-out and ripped, but that’s how the comics were and it’s only fitting, as awkward as it can look from time to time, that this film look exactly the same. Every character looks just as they should for this feature, with not a one seeming out of place, which is heavy praise given the obscene amount of characters that appear, even just for a few seconds. Not a single one looks out of place. However, in terms of animation, this movie is a bit of a step down from Green Lantern: First Flight, the previous title in the DC Universe Animated Original Movie line. While that movie was absolutely stunning to behold, here I find the animation to be a bit underwhelming. While not weak by any means, it also doesn’t seem to be up to snuff from the recent efforts, particularly in the first third of the film where we see an odd mix of both weak and strong CGI (sometimes in the same scene, particularly some of the cityscapes). The animation isn’t horrible, far from it, but just pretty average, even feeling a little rushed at the beginning before smoothing out during the second and third act. Again, it’s not bad animation, and is barely worth noting really, but it’s just a noticeable step down from the near flawless animated execution of Green Lantern: First Flight. The directing for this feature does a superb job at keeping everything together, no matter how over-the-top the movie gets as it progresses towards that big finale. The staging for the movie is well-handled, particularly during some of the more complicated action sequences. Superbly directed by Sam Liu, he brings the same crazy intensity he used on Hulk Versus and really invigorates this Superman/Batman buddy flick. This film would have been an utter disaster without the right person directing it, and Liu was the perfect choice for Superman/Batman: Public Enemies. Whether it’s a small fight sequence between a handful of heroes or one featuring dozens of foes, Liu brings a certain cohesion to it that keeps it on the same level of excitement without going particularly overboard at any time. The score by Christopher Drake is definitely worth noting. A great follow-up to his epic work on Wonder Woman, Drake’s score manages to perfectly accent the entire movie, whether it’s a dramatic revelation or a wall-to-wall fight scene. Not a second of music feels out of place or misdirected, it’s just a great score that fans should definitely consider adding to their collection. Bizarrely, this movie would feel right at home in the DCAU. Likely due to the presence of the main voice cast, Superman/Batman: Public Enemies seems like a natural extension of the previous Batman and Superman team-up episodes from Batman: The Animated Series and Superman: The Animated Series. The voice work in particular gives the viewer that extra sense of actually knowing the characters, and aids in both filling in any gaps left open by the story itself and providing a sense of familiarity. For the main cast, Kevin Conroy is as brilliant as veer as Batman, with both Tim Daly and Clancy Brown shining in their respective roles as Superman and Lex Luthor. This goes to show just how important casting the right voices for these features are, and how having an absolutely ideal cast makes it a bit easier to overlook whatever problems the film may have. Now, that’s not to say this story is riddled with plot holes, but the animated version of Superman/Batman: Public Enemies manages to bring together aspects of the story in a more coherent and sensible way than the original comic version by famed writer Jeph Loeb. Writer Stan Berkowtiz trims a major amount of fat off the original story, leaving us here with a leaner, more enjoyable final product. Whether or not I’ve made it clear (highly unlikely), I enjoyed this animated feature. By no means would I call it the best nor would I label it the worst. While it is deceptively average, it’s also undeniably enjoyable, and makes no attempt to hide what it is. Much like the comic series that spawned it, Superman/Batman: Public Enemies is an animated “summer blockbuster,” full of elaborate set pieces and over-the-top superheroics. More importantly, it’s also fun, and I think that’s really key here. There’s an underlying hint of fun to the proceedings that really gives the movie its charm. Whether it’s the playful yet respectful banter between the two leads, the off-color yet hilarious joke that really kicks off the entire movie, or the obvious references toward Power Girl’s assets, etc., the crew behind Superman/Batman: Public Enemies never forgets to instill a little fun amidst all the action and drama. In comparison to the other features in the DC Universe Animated Original Movie line, this film rank does stand up in terms of execution. While the animation may not be the best, especially coming after the absolutely stunning Green Lantern: First Flight, it does feature probably the most full-bodied script. Sure, the story is light, and perhaps that is why everything feels fleshed-out as compared to some of the other features. My main issue with all of the previous films in this line is the fact that the writing seems to be a bit hampered by the running time. That if each film had a just a few more minutes, everything could be fleshed out nicely and given room to breathe. For Superman/Batman: Public Enemies, I find the writing works perfectly here. Not once did the short running time seem to be a hinderance and, surprisingly, it actually aids in movie not overstaying its welcome. While the film may not surpass the likes of Wonder Woman or Justice League: The New Frontier, it can stand proudly next to the under-rated Superman Doomsday and enjoyable Green Lantern: First Flight. If you enjoyed the original Superman/Batman: Public Enemies comic story-line, then you’ll love this without a doubt. This may not be the sharpest film to date in the DC Universe Animated Original Movie line, it’s still flat-out fun from beginning to end. With the appropriate banter between the two leads, nicely staged action and the over-the-top summer blockbuster plot, it’s definitely an enjoyable ride. Toss in a good script, a great voice cast and some nice animation, and it’s easy to classify this as another successful (if flawed) addition to the DC Universe Animated Original Movie line. Superman/Batman: Public Enemies ends up being a surprisingly good film even though it doesn’t tread any new ground whatsoever. It’s not up to code with some of the previous efforts as explained above, but it’s still a welcome diversion. I’ll give this movie the Recommended stamp but with reservations. I’d encourage renting this movie first for the undecided viewers before opting to purchase it. 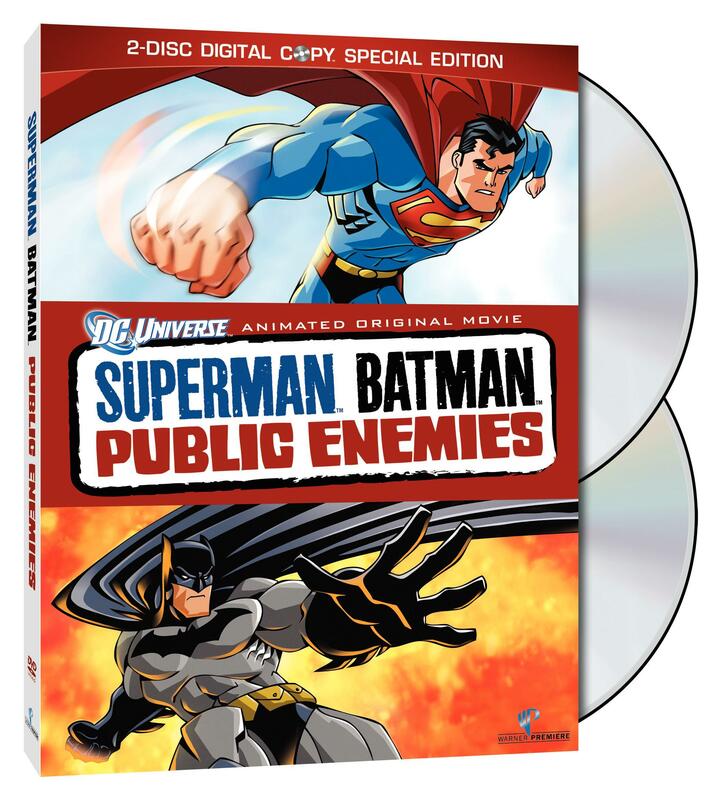 Along the line of Warner Home Video’s previous “Two-Disc Special Edition” DVD releases in the DC Universe Animated Original Movie line, we pretty much get the same treatment here for Superman/Batman: Public Enemies. The two-disc DVD release features the standard Amaray case with a reflective foil/embossed slipcover, housing a single insert inside for the Digital Copy redemption code. Looking inside, let’s start with the audio and video transfers. Warner Home Video does a fine job with the audio and video quality here for the standard definition DVD release. The video transfer is great here, with the colors popping through quite nicely on all fronts. There’s some slight compression to be seen here and there, resulting in some artifacting and interlacing, but nothing too distracting. Moving on, the 5.1 Dolby Digital audio transfer here is decent and does a good job at translating those seemingly endless fisticuffs and booming explosions. Not as aggressive as it could, mind you, but everything sounds clear. The audio mix also isn’t as immersive as it could be, with the audio transfer feeling more front-loaded, but the result is still just fine. Moving on to the extras, Warner Home Video again includes a mixed bag of content, bringing in both new and old material. While there is roughly two and a half hours of bonus material, as proudly stated on the packaging, a good chunk of it is carried over from previous releases in the form of bonus episodes and repeated featurettes, leaving roughly an hour of new content. The bonus material breaks down to “A Test of Minds: Superman and Batman” featurette, “Dinner with DCU and Special Guest Kevin Conroy, ” “A First Look at Justice League: A Crisis on Two Earths,” “Blackest Night: Inside the DC Comics Event,” “”First Look” at previous DC Universe titles,” and two “Bruce Timm Presents” bonus episodes. The first disc features just trailers for other Warner Home Video titles and the promotional features for some of the previous DC Universe Animated Original Movie titles, as well as the current Blackest Night comic crossover event. That’s it for that disc, folks. Moving on to the second disc, first up is the twenty minute featurette “A Test of Minds: The Psychology of Batman and Superman,” an interesting look at how these two famed super hero characters tick. Looking at both the why and how, a handful of authors dissect the relationship, both apart and together, of the World’s Finest super-hero team. An interesting look at Batman and Superman, admittedly. “Dinner with DCU and Special Guest Kevin Conroy” is next on the list and, well, the title should say it all, really. Clocking in at nearly a half an hour, this bonus feature joins Kevin Conroy, Bruce Timm, Andrea Romano, and Gregory Noveck as they, well, sit around a dinner table and just chat away. And as vanilla as that may sound to some people, it’s the complete opposite here. I would label this as required viewing for any fan of DC Animation, specifically the “extended” version featured on Blu-ray release of Superman/Batman: Public Enemies. The DVD version here still includes a nice chunk of interesting tidbits, however. Not just Superman/Batman: Public Enemies is talked about, but Batman: The Animated Series, the DCAU, and even the work of other key voice actors to DC Animation and the Batman mythos. It’s really interesting, even this half an hour abridged version, but I strongly recommend fans seek out the hour-long version included on the Blu-ray release of Superman/Batamn: Public Enemies. Moving on, “A First Look at Justice League: A Crisis on Two Earths” provides a close look at the next DC Universe Animated Original Movie title. A reworked version of Dwayne McDuffie’s famed Justice League: Worlds Collide script, the Justice League faces off against villainous counterparts from another universe in what looks to be another superbly designed feature. With McDuffie on script and direction by Lauren Montgomery and Sam Liu, this looks like it could be the best title in this still young direct-to-video line to date. It looks great, the voice cast is impressive, and the pedigree behind it is staggering. Let’s all hope for the best come Spring 2010. Rounding out the collection are “Bruce Timm’s Top Picks,” featuring the two Superman: The Animated Series episodes “Knight Time” and “The Demon Reborn.” Both featuring team-up stories with Batman and Superman, both are work checking out even if they don’t fully exhibit the high quality of Superman: The Animated Series. Nonetheless “Knight Time” remains a solid team-up mystery and “Demon Reborn” an entertaining if typical duke-it-out team-up jaunt. As an overall package, Superman/Batman: Public Enemies is a good release on all accounts. The main feature is definitely worth checking out and the bonus features are surprisingly entertaining. Even though the Blu-ray release for Superman/Batman: Public Enemies is easily the best version of this title to own, the DVD release is nothing to scoff at. While a good portion of the bonus materials are repeated content, in terms of bonus episodes and preview trailers, the original bonus content is definitely worth a peak, even if it only provides roughly an hour of new material. 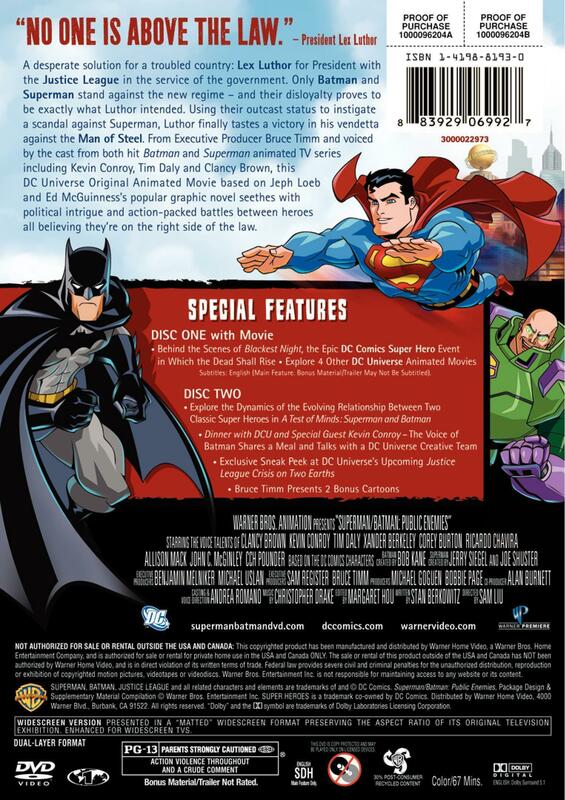 The Two-Disc Special Edition DVD release of Superman/Batman: Public Enemies is definitely Recommended to pick up, but, as usual, I feel the need to encourage readers to pick up the Blu-ray release over this one if possible. Superman/Batman: Public Enemies is now available on DVD and Blu-ray.